The screen could have been better - in terms of viewing angles in particular - but it stacks up very well against mid-range competition. The camera was also pretty good, especially the HD video recording. And we didn't spend too much time crying over the non-unibody design, easy access to the battery makes up for that (and you get the added bonus of being able to spruce things up with a colorful new back cover). The Nokia Lumia 710 has certain limitations: storage is non-expandable, and 8GB isn't spectacular to begin with. USB and Bluetooth usability is limited too, but those are par for the Windows Phone course. And only two other devices come with free voice-guided navigation, both of which are Nokia made. The first is the Nokia Lumia 800, of course. It has a polycarbonate unibody and an AMOLED screen (with a PenTile matrix though), a higher-res still camera and double the storage. The other is the Lumia 900, which boasts a 4.3" AMOLED with a full set of pixels and LTE connectivity. That will be exclusive to AT&T for a while when it launches though. The Samsung Omnia W I8350 (or Focus Flash I677 in the US) is a direct competitor to the Lumia 710. Its 3.7" screen is a Super AMOLED and the phone is thinner and lighter despite its metal back. The HTC Radar is also in the game, with a slightly bigger (3.8") S-LCD screen and an aluminum unibody (which means the battery is inaccessible). It only has a 1GHz CPU though. You might also want to look around for an Acer Allegro - it's only available in some countries and has some disadvantages (1GHz CPU, the LCD screen is 3.6") but if it's available in your area, you should be able to find it at a lower price point. Another thing to note is that, unlike the Finns, these three use regular-sized SIM cards. It doesn't have to be a Windows Phone handset - there are other alternatives outside the leading platforms, iOS and Android. The Samsung S8600 Wave 3 runs Bada and packs a 4" Super AMOLED in its 9.9mm thin body, which is mostly metal. It may be old school, but Symbian Belle is very usable and the Nokia 701 offers an amazingly bright display (1,000 nits, though it's smaller and lower res - 3.5" nHD), a metal build and Nokia's free voice-guided navigation (with richer settings to boot). The Nokia Lumia 710 is competing in a very tough game. 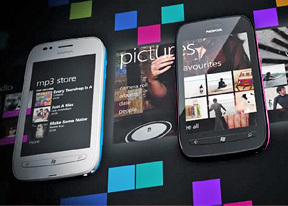 Mid-range WP7 handsets have virtually identical specs and clear advantages over competitors are hard to come by. The Lumia 710 carries Nokia's pedigree and some exclusive software, which have a lot of appeal, but newcomers to the brand might not be so easily convinced. However, in a world full of ageing Symbian smartphones, there should be plenty of business for the Lumia 710.